Home / Entertainment / Celebrity Owned Restaurants You May Not Know Existed! 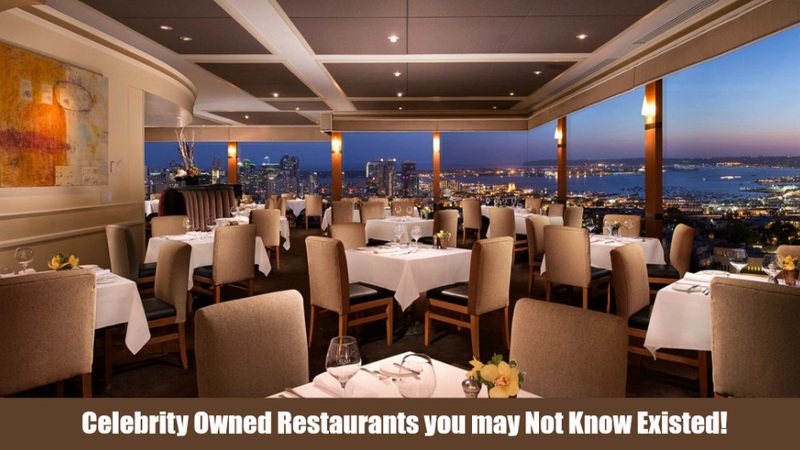 Celebrity Owned Restaurants You May Not Know Existed! Stars! Celebrities! Big Names! You find them everywhere: on screen, in magazines, social media, markets, pubs, and elsewhere. They are known for the action, drama and romance they create on the screen, but have you ever imagined what they are doing once they are out of the glitzy, glam life? Perhaps expanding their reach in the business world with different ventures, like restaurants for example. Yes, folks! You heard it right! Many celebrities open restaurants as an investment. Having a restaurant is a hot trend among celebs; they are turning their passion for food into a business. Celebrity-owned restaurants also attract visitors who just hop in to have a glimpse of their superstar. It doesn’t hurt to use their celebrity status to be successful in the restaurant business. Hey girls! Do you want to feel cozy with the hot Ryan Gosling? Ryan Gosling was in the celebrity news headlines when he opened his Moroccan restaurant Tagine in the Beverly Hills area. It’s one of the most romantic places with a candle-lit ambiance, lots of coziness and hot tempted food with a modern twist. They have mouth-watering North African stew and chocolate soup on the menu! Do you often fear of dining out just because your little monsters mess up things in the restaurants and you end up feeling ashamed? Well, not at the Au Fudge! A restaurant owned by Jessica Bell and husband Justin Timberlake are serving completely organic and kid-friendly food in West Holywood, California. They serve organic, dye-free and healthy food with candy treats for kids. There’s also a creative area in the restaurant where kids can play under the supervision of au pairs, hired by the restaurant. Jay Z ownsthe 40/40 Club, started in NYC, back in 2013 is a restaurant, sports bar and nightclub for the people who not only want entertainment but also want to eat a delicious meal. Offering a public space and a private area, you can watch games, eat amazing food, enjoy late night drinks all in the restaurant. Confused by its quirky name?It’s a baseball term, for the record the players have set for hitting 40 home runs and 40 bases in a single season. Ah! How creative! Who doesn’t love eating pizza and pasta! At the Joanne Trattoria, savor the flavors or Italian eatery andenjoy the cozy vibes. Owned and operated by the Lady Gaga’s parents, it is situated at the Upper West Side of the NYC. Kandi Burruss, when not participating in the drama, you might find her stirring a pot with her husband. The resturant is named The Old Lady Gang and is located in Atlanta.It serves delicious Southern recipes. They have fried chicken, shrimp, and grits on the menu. The Canadian rapper along with his OVO associaties opened a restaurant in Toronto to offer top-tier services and a delicious menu from Antonio Park, the executive chef. Saint and Sinners, is a bar/restaurant that not only pays homage to New Orleans, but also pays tribute to the Burlesque District, the city’s Storyville red-light area. In the mood for some sothern cusine? Their menu is packed with southern flavors like jambalaya and fried alligator tail. The restaurant is appropriately named after Toby’s hit song, ‘I Love This Bar.’ Situated in Foxborough, Massachusetts, a family restaurant if you dine before 9 and open to adults afterwards. It becomes an adult-only music venue after 9 p.m. You can savor the delicious menu filled with smokehouse nachos, freedom fries and more. Owned by Mark and Donnie Wahlberg and their chef-brother Paul, the restaurant is famous for serving delicious hamburgers. With locations across Canada and the United States, the business of burgers is a family affair. Serving specialties like salads, sandwiches and of course burgers, it will be challenging to pick just one thing to try. So, this completes the list! Do visit these restaurants for delicious foods and a chance to see stars up close and personal!